The Medusa Plot by Gordon Korman. A 39 Clues: Cahills vs. Vespers Book. Review: Imagine that all at the same time your closest relatives and friends are kidnapped. The only way to prevent them from being hurt is to follow orders given by an anonymous person. 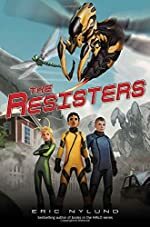 In the first book of the Cahills vs. Vespers series, The Medusa Plot written by Gordon Korman, Amy and her younger brother Dan face this problem. All at once, members from all of the Cahill clans are taken by a mysterious organization called the Vespers. Ever since the time of Gideon Cahill the Vespers have been after the family. The leader, Vesper One, gives Amy and Dan instructions which if followed will keep their family alive. Unable to turn to the police, they turned to their family, who struggle to work together and has argued for years. With the little help they get, they go to Florence, hoping to appease the Vespers and keep their family alive. 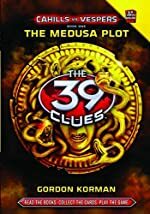 The Medusa Plot follows the first 39 Clues series and to better understand it I suggest that you read the other 39 Clues books. If you read this book first, then it will spoil the ending of the tenth book in the first series. All of the characters are exciting, none of them with the exact same personalities. The plot and action are described fully and make you feel like you are with the characters. With some of the character's lives on the line there is a high level of suspense throughout the entire book. The genre of the book is realistic fiction but there is an extremely low chance of any of the events in this book happening. The pace is very fast and you get hooked right away on the first page. I rate this book a 10/10 and I rate the entire 39 Clues series a 10/10. After you read this book you will be hooked onto the entire series. We would like to thank Scholastic for providing a copy of The Medusa Plot for this review. Have you read The Medusa Plot? How would you rate it? Rip Tide by Kat Falls. An Al Roker Book Club Selection. Review: The beautiful ocean. A home to many things. Fish live in the ocean as well as plants and of course, pioneers. Wait, pioneers? Yes! 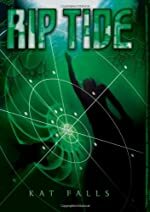 In Rip Tide by Kat Falls, you will discover what it's like to live on the bottom of the ocean! Rip Tide is only one of many adventures for 15 year old Ty's in the Dark Life series. Ty is not your average boy. Now because Ty is born on the bottom of the ocean, he possesses something called a Dark Gift. He sends out clicks of sonar (like a bat) and receives a mental picture back! This gift is very useful when in the ocean. Ty and his best friend Gemma like to explore the ocean a lot. Well, at least Ty does. There was an incident with Gemma, so she doesn't enjoy the ocean as much as she used to. Anyway, one day Ty and Gemma are in a trash vortex looking for a place to hitch the submarine. Ty gets his swim gear on and goes into the ocean where he finds a good place. But once Ty looks at it more closely, he discovers that it is really a township (floating building) chained to the ocean floor! Ty is going to unlock the ship when a "red devil" charges at him! Ty manages to stop the "red devil" and its pack from eating him and unhitches the township. Once Gemma and Ty reach the surface, they turn in the ship to the Seaguard. Meanwhile, his parents have a meeting to sell crops to a surf named Drift, and Ty wants to be there. Ty makes it to the meeting just in time to see his parents being kidnapped by Drift! Pioneers are not very reliable or trustworthy people, and Ty tries to stop them, but he can't. Now only two questions cross his mind: Why is Drift kidnapping his parents? And where is he taking them? Gemma and Ty decide to try looking for them. While doing this they come across many challenges and rewarding experiences. Will Ty ever find his parents? Rip Tide is an amazing book! It is action packed, suspenseful, and even a little romantic. I love how Ty is willing to do anything for his friends and family. I also enjoy the idea of getting to live underwater. It's like you're actually living a fairy tale life. But one of the best parts of Rip Tide is the wonderful descriptions of the terrible and great creatures of the deep. They are really fantastic; it's as if you're watching the movie right before your eyes. Gemma and Ty's bravery ties the book together and completes the story. Rip Tide is for people who are ready for adventure and suspense! We would like to thank Scholastic for providing a copy of Rip Tide for this review. Have you read Rip Tide? How would you rate it? The Branding by Micaela Wendell. 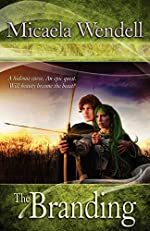 Review: A quest and a curse, both doom Morwen Aleacim, a teenage elf, to death. Morwen is the main character in The Branding , and lives in the village of Aren. The Branding is a captivating tale and from the first sentence it keeps you on your toes until the very last page. The Branding is a great read for anyone who likes fantasy. For example, there are wizards and elves going on quests. Morwen, goes on a quest to get a hideous curse off of her that only the wizard king can remove. The Branding is about quests, curses, and doing what everyone else wants even if you don't like it. As an example, the elders of Aren want Morwen to act like a girl instead of like her tomboy self. She wants to learn to fight but the law forbids it. So a real human swordsman offers to help her fight. His name is Armando. The training takes place when everyone is sleeping. Later on in the story, Morwen and her sister Brynn are trapped by a dark wizard named Tobais. Morwen gives up her life and freedom in order to save her sister from the same fate. Then Tobais brands her once he lets her sister go. When The Branding takes over her body, Morwen will become a servant to Tobais forever. After that she sets out on a quest to try and remove the curse. On her way she meets Alan a handsome elf. Together they pursue her quest and make new friends and enemies. Captivating, thrilling, and exciting are the words I would use to describe The Branding . After reading The Branding , it makes you want to read the sequel Micaela Wendell is writing. The Branding is a great read from beginning to end. Micaela Wendell is a very talented author. The story flows smoothly from one idea to the next. For example, in The Branding Micaela Wendell wrote "... 'You'll be transformed into a puppet for me to use at my disposal!' He cackled maliciously, and then silence. Morwen shot upright, leaving a puddle of icy sweat soaking her pillow. 'I must have taken a nap when we got back from town and had a bad nightmare.'" This piece of the story shows how her writing flows from one idea to the other. I recommend The Branding to whoever likes fantasy stories. We would like to thank BelleBooks for providing a copy of The Branding for this review. Have you read The Branding? How would you rate it? The Friendship Doll by Kirby Larson. Review: A doll that can talk to children in only their minds sounds pretty odd, right? Well that's exactly what The Friendship Doll by Kirby Larson is. This book is quite possibly one of the greatest books I have ever read. It is 201 pages long and is based on actual dolls that arrived in the United States from Japan. The Friendship Doll begins with a doll named Miss Kanagawa being created in Japan. She, along with 57 other dolls, are transported to America as a sign of friendship to the American children. Miss Kanagawa is presented to New York City in the year 1927, and she awakens the heart of little Bunny. When Miss Kanagawa awakens children, she can speak to them through thoughts. Her thoughts tell them the right thing to do and through her thoughts she bonds with the children. Miss Kanagawa connects with the following children: Bunny, Lois, Willie Mae, and Lucy. Bunny, wanting no more than love from her parents, wishes to cause her classmate Belle Roosevelt embarrassment when she officially presents the doll to New York. Lois is a girl from Chicago and gets the wonderful gift to go to the Chicago World's Fair. While there, she meets Miss Kanagawa, who helps her decide to think of her friend instead of herself. Willie Mae is a little girl, living in Kentucky, who loves to read. When the opportunity to read to a wealthy (and quite rude) elderly lady comes up, she takes it to support her family. Yet Willie Mae is not the one whose heart is awakened, it is someone else's. And through tragedy, Miss Kanagawa learns a great meaning of love. Lastly comes Lucy. Lucy is a little girl whose mother died, forcing her father and her to make the great move to California. Lucy and her father change through their trip when unexpected turns come, but Lucy keeps a brave face. Miss Kanagawa, at a museum, touches Lucy. However, when Japan bombs Pearl Harbor, Miss Kanagawa is shut away. Even the Great Depression couldn't keep Miss Kanagawa from touching the hearts of people. But, WWII is different. Eventually, Lucy's grandson finds Miss Kanagawa in present-day, and the awakening begins again. The Friendship Doll is based on the true story of how dolls from Japan arrived to America. Even though 58 dolls arrived in America, 13 are nowhere to be found. The author used magnificent time transitions in this book. The setting and plots are perfectly woven together, like the fact that the book takes place in the Great Depression makes the emotional sense of the book quite interesting. Through this book, I found myself learning lessons from the characters and even feeling touched by Miss Kanagawa herself. All in all, this book is a must read for readers everywhere who want to know the true meaning of friendship. We would like to thank Random House for providing a copy of The Friendship Doll for this review. 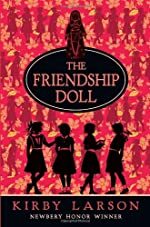 Have you read The Friendship Doll? How would you rate it? The Dark and Hollow Places by Carrie Ryan. a Forest of Hands and Teeth Book. Review: What would you do if you knew you had only a few days left to live? This haunting question plagues Annah as she battles for not only her life, but for the lives of all other living people in Carrie Ryan's third installment in her Forest of Hands and Teeth series - The Dark and Hollow Places. In this dystopian novel, Annah must come to terms with her past - leaving her sister in the Forest of Hands and Teeth, the horrific scars she endured from the barbed wire, and her uncertain feelings for Elias after he left to join the Recruiters - if she has any hope of ever having a future. Annah's world ended when Elias left to join the Recruiters, and the longer he stays away, the more she realizes she's on her own - alone to try to escape the horrors of the Return. Over time, Annah becomes self-sufficient and learns secrets to avoiding the Horde and the Unconsecrated. However, a hole exists in her soul without Elias. In many ways she's as dead and void of life as the desolate world that surrounds her. But, when she runs into Catcher, a boy who in many ways reminds her so much of Elias, she finds that there might be a little life still left inside her. Catcher, however, is mysterious and comes to Annah with not only hope, but also heavy laden with secrets that cloud his past and more importantly link to her past as well. As Annah's feelings for Catcher grow, it becomes very clear that her past will come back to haunt her and she just might have to decide what she would do if she only had a few days left to live. 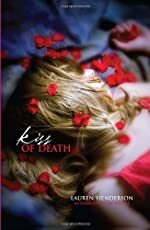 Carrie Ryan blends horror and romance in such a way that will capture the hearts of young adult readers. The Forest of Hands and Teeth series is about a dystopian world in which people don't merely die, but they come back to haunt and feed off the blood of the living. To truly understand the world in which Annah lives, as well as the characters and challenges they face, it is critical to start at the beginning of the series. However, readers will be excited they did! The Dark and Hollow Places is thought-provoking and makes readers take a look at the world in which they live. When Annah is trying to make sense of her world, she says, "Maybe, I just wonder sometimes if that's why all this happened. If there wasn't enough good in the world and that's what caused the Return. People got greedy and selfish with their lives and were unwilling to let it go in the end when it was time." Readers can't help but wonder what the lasting effects of a greedy world will be - and maybe seeing Annah's world is enough to make people think twice about how they live. Also, the character dynamics are well developed. Annah is a complex character that grows exponentially throughout the series. She makes realizations in The Dark and Hollow Places that show a wealth of maturing, plus her relationships with Elias, her sister, and of course Catcher, light the pages on fire. The story is complex, yet so compelling, readers find themselves reading into the wee hours of night - and then checking under the bed for an Unconsecrated! Although there does not seem to be a sequel in the making, it certainly seems like Annah's story is not finished - which will certainly make Carrie Ryan fans very happy! We would like to thank Random House for providing a copy of The Dark and Hollow Places for this review. 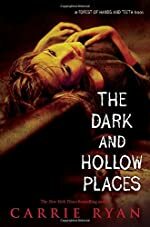 Have you read The Dark and Hollow Places? How would you rate it? Flying Feet by Patricia Feilly Giff. A Zigzag Kids Book. Review: When it comes to athletes, dancers, or singers, there is always an invention in mind. If you are looking for a book that has many different inventions - with a twist - then the book Flying Feet by Patricia Reilly Giff and illustrated by Alasdair Bright is right for you. In this hilarious third book in the Zigzag Kids series, a young boy named Charlie and his friends Mitchell, Habib, Gina, Sumiko, and Destiny do everything they can do to get a school holiday to occur. But, along the way, they face many different challenges that block them from doing it. Charlie loves making inventions. But most of them don't really work. However, he's determined to be able to make an invention with shoes that will help him be able to walk up a wall. He's hoping this invention will be the one that makes everyone at Zigzag Afternoon Center think he's as good as his big brother. When the art teacher gets sick and is not able to plan the school holiday, Charlie finds out there is something else he can do to be special. He works with his friends to help make sure the art teacher's holiday can really happen. Flying Feet is filled with fun, and it will become a quick favorite for early readers. Flying Feet is a great book for early chapter book for readers ages 6 to 9 year olds. It has silly and entertaining illustrations in it. Plus every page is filled with silly occurrences and excitement as the reader wonders what will happen next. Finally, the printing in this book is also larger for younger readers, and the cover is very colorful and shows that the characters in the story are excited to do something really fun. Right away early chapter book readers will be excited too! Review written by Andrea (7th grade student). We would like to thank Random House for providing a copy of Flying Feet for this review. 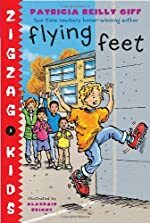 Have you read Flying Feet? How would you rate it?